Are you looking for a great foundation for your next powerhouse? 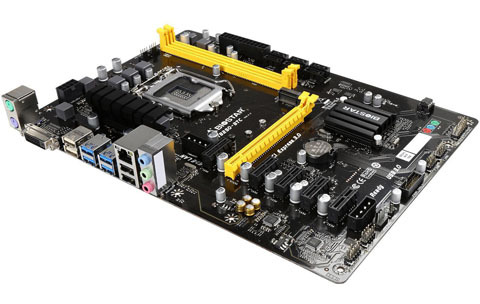 Look no further than the BIOSTAR TB250-BTC Motherboard. It’s built and designed with every aspect DIY enthusiasts value most in mind – including premium components, excellent video & audio capabilities, blistering-fast data transfer speeds, ultra-durability, maximum reliability, etc. Give your small business a boost with the Intel B250 Chipset and the 7th Generation Intel Core processor. The Intel B250 chipset provides you with the power and performance you need for your small business. The HD audio component provides high quality sound with minimal loss of audio fidelity. DirectX 12 introduces the next version of Direct3D, the graphics API at the heart of DirectX. Direct3D is one of the most critical pieces of a game or game engine, and ’BIOSTAR has redesigned it to be faster and more efficient than ever before. Direct3D 12 enables richer scenes, more objects, and full utilization of modern GPU hardware. PCI-e M.2 32Gbps is the latest storage interface. It delivers the highest bandwidth and lower latency. 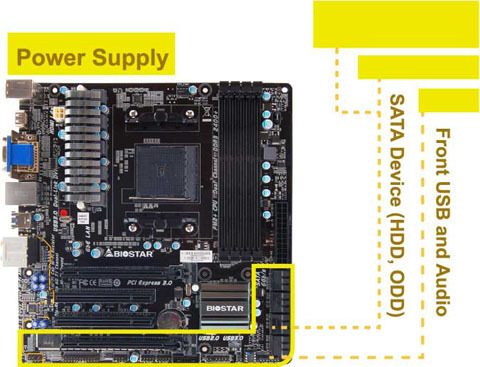 It's three times faster compared with PCI-e M.2 10Gbps. 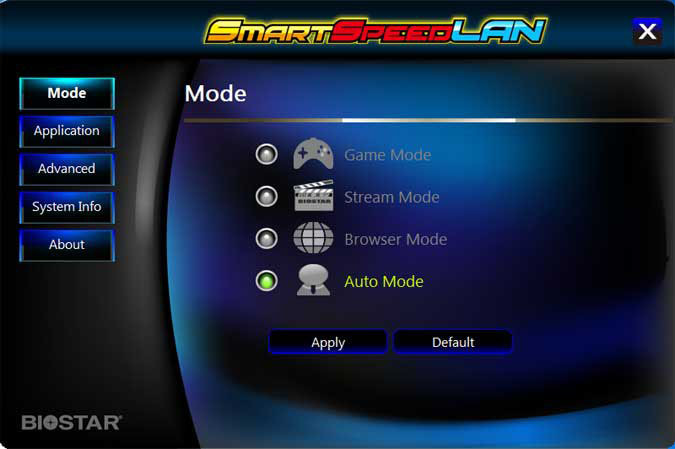 SmartSpeedLAN is a free software application which monitors and manages your PC's network behavior. With user-friendly GUI, it allows you to select and prioritize different types of network traffic, including gaming, media streaming, communications and web surfing. You can also set any specific applications, choosing to prioritize or block accordingly. SmartSpeedLAN can feature automatic management options that use adaptive networking intelligence to ensure that you are getting the best online experience possible. PCI-E 3.0 is the next evolution of the ubiquitous and general-purpose PCI Express I/O standard. At 8GTps bit rate, the interconnect performance bandwidth is doubled over PCI-E 2.0, while preserving compatibility with software and mechanical interfaces. Experience fast data transfers at 5 Gbps with USB 3.0. Built to connect easily with next-generation components and peripherals, USB 3.0 transfers data 10X faster and backward compatible with previous USB 2.0 components. The popularity of PC usage and working environment is getting deteriorating and moist (rural, coastal, etc.). The PCB will be oxidizing easily by damp or absorbed moisture, and ionic migration or CAF (Conductive Anodic Filament) will be generated. Moisture-proof PCB meets high density and high reliability requirements for moisture resistance. 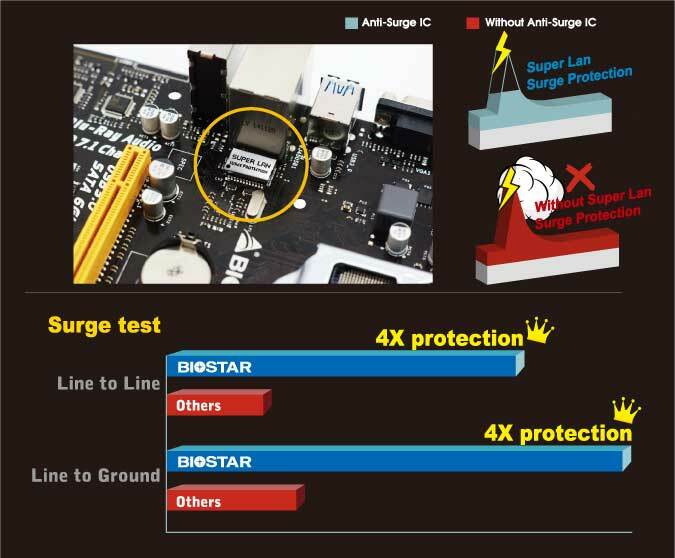 BIOSTAR exclusive Anti-Surge design provides the best protection of board and extends the product life. Having the latest model of "Transient Voltage Suppressor" on-board can effectively protect the board circuit, reducing the shocks caused by ESD as well as other damages arising from overvoltage transients to enhance system durability. ESD (Electrostatic Discharge) is the major factor to destroy PC by electrical overstress(EOS) condition. ESD occurred when PC users touch any devices connected to their PC, which may result in damage to motherboard or parts. 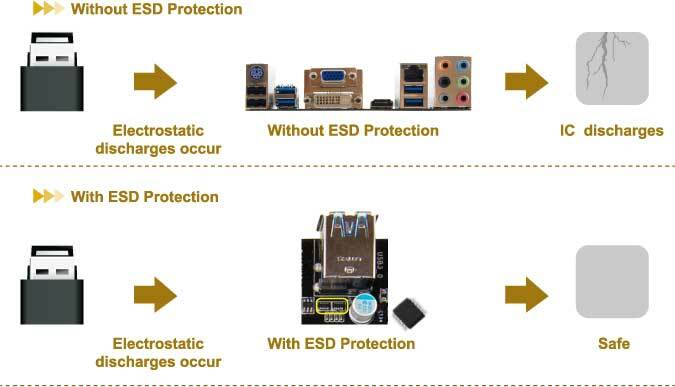 ESD protection is designed to protect the motherboard and equipment from damage by EOS . Onboard dedicated power fuse helps prevent USB port failure. It prevents USB Port overcurrent and safeguards your system and device lifespan. All BIOSTAR special circuit design detects overvoltage conditions and prevents voltage surges from spreading in real time. It also actively cuts off the overvoltage supply to protect your system. Over current protection helps protect motherboard from damage during overclocking or an unusual current importing. Over heat protection prevents motherboard & CPU from burning when exceeding the temperature limitation. Users can easily assemble their own computer with simple-swap data discs and other accessories.